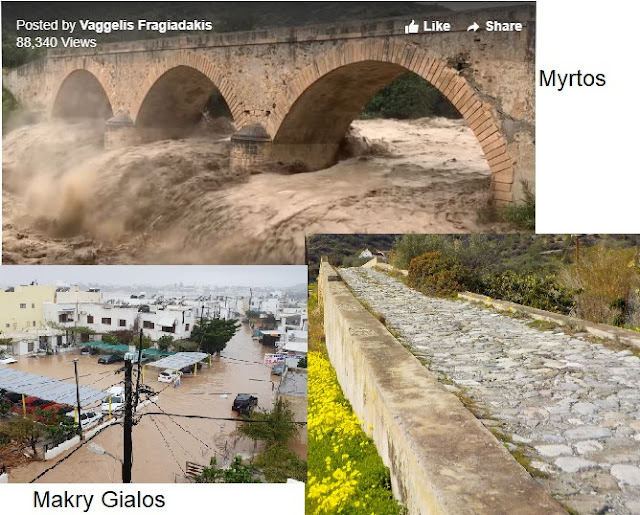 Welcome to the village of Agios Ioannis, or Saint John if you want a rough English translation. It’s a village very much in slow transition at the moment. 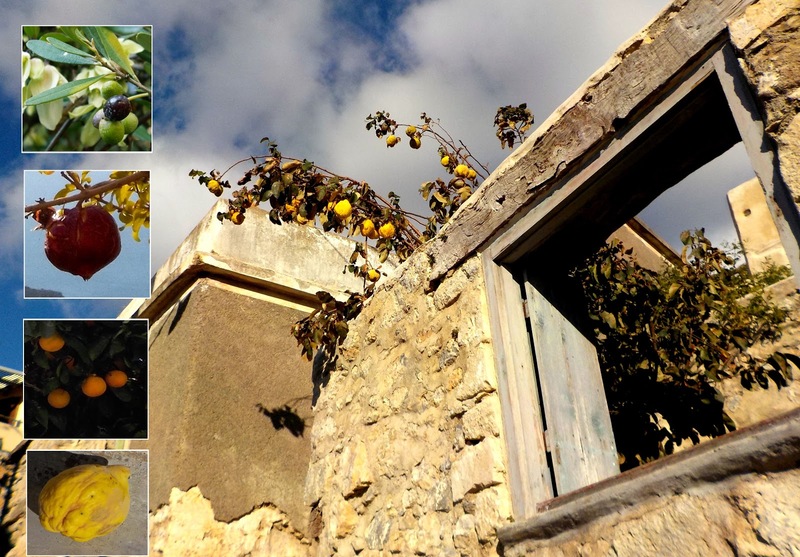 Once an important hub of life in the area, over the past few decades people have gradually moved down to the seaside villages of Ferma and Koutsounari or the nearby town of Ierapetra. I read recently that in the last census the official population was somewhere in the region of eleven, all of them avid vehicle collectors judging by the number of cars I see parked around the place at times. However, the place seems to be coming back to life with newly refurbished dwellings standing cheek-by-jowl with tumbledown relics. This looks like the path down into the village so let’s follow it and see what we can find. 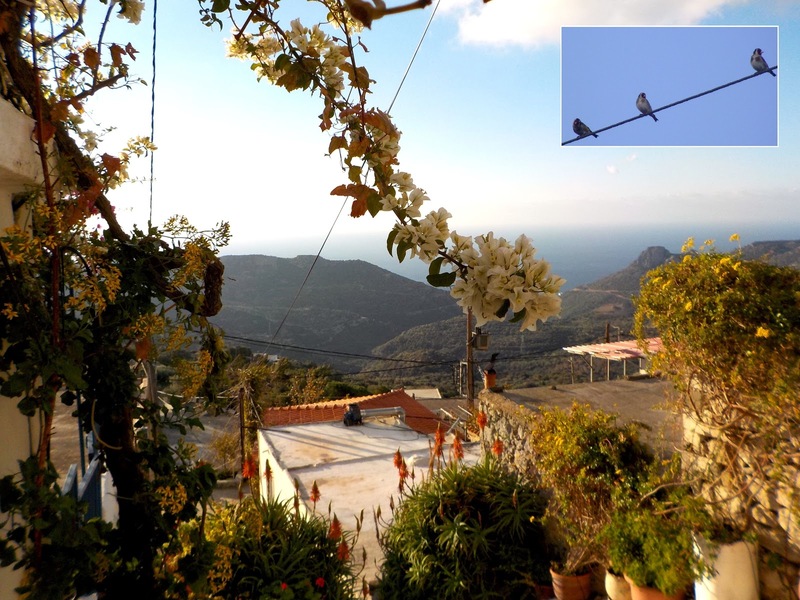 As you’ll notice it’s very steep but it affords wonderful views of the Lybian Sea and the lower part of the Milonas Valley that we’re going to explore (if you can see through the riot of flowers that seem to be taking over the village like triffids). The birds that are lined up along the wires with the pretty red faces are Goldfinches. They’re resident here, as they are in most of western Europe but tend to be more noticeable when they flock together in the winter. They’re particularly fond of thistle seeds and in Christianity they’re associated with the crown of thorns placed upon Jesus’ head at the crucifixion. A painting by the Italian Renaissance artist Barocci shows John the Baptist (after whom, presumably, this village is named) holding a goldfinch out of reach of a cat who is eyeing it up in a most unchristian manner. A scene which is very easy to visualise here as, like in most Cretan villages, cats are legion. These three (there’s a third one hiding by the potted pelargonium) look reasonably well fed and are probably semi-domestics. Cat ownership in Greece is a little different to that in northern Europe. Generally they’re not allowed indoors, they’re not spayed or neutered and lead semi-independent lives. This leads to unchecked breeding of the street-wise taverna beggars who thrive in the summer but face great hardship in the winter when the tourist season finishes. The question is: to feed or not to feed? Difficult to resist a cute looking cat mewing at your feet when you’re tucking into your fish supper but if you feed ‘em you breed ‘em and the problem escalates. Cats aren’t the only one of man’s imports to the island. We’ve also brought quite a variety of fruits with us over the years. The ubiquitous olive came to us from the Middle East, the pomegranate from India/Iran and oranges were brought in to the Mediterranean from south west Asia by the Moors in the tenth century. The ancestors of this magnificent quince, making an escape bid from this derelict building to our right, originally came over from South-West Asia, Turkey and Iran. We are very much in a man made environment here but is it unnatural? Birds distribute plant seeds, beavers substantially alter their environment and rats move fleas about so are we just another animal doing essentially the same with fruit, houses and cats? I can resist it no longer. I simply have to poke my nose into one of these derelict dwellings and see if there’s anyone in residence. 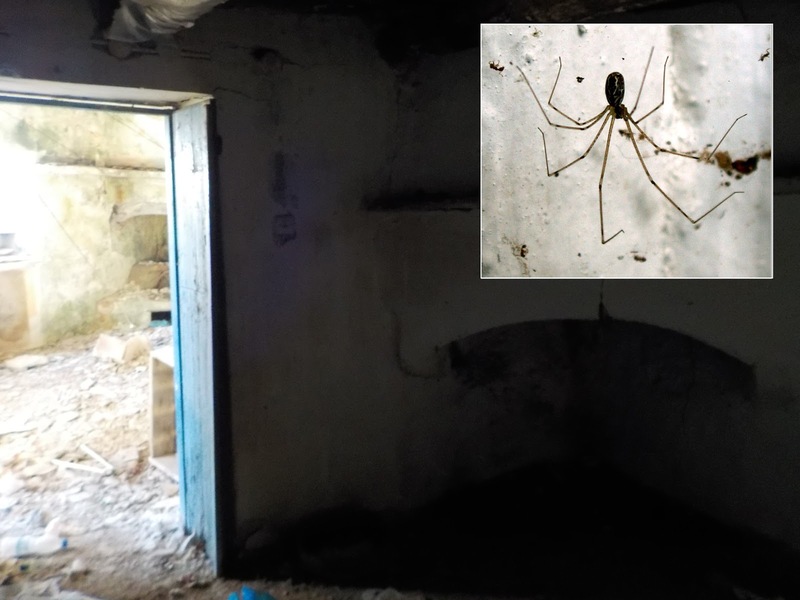 Look, a Marbled Cellar Spider. These are great spiders who build their webs in the same ramshackle way that pigeons build their nests. The webs aren’t sticky but prey gets entangled in the very randomness of the threads which seem to go every which way. Not that they rely on trapping as their sole means of finding a meal, they’re quite prepared to go out and hunt for their prey. One of their favourite tricks is to sneak up on an unsuspecting house spider and vibrate its web. When the house spider comes running to see what he’s caught he suddenly finds himself on the receiving end. Underhand maybe but it keeps us from being overrun by house spiders. We seem to have reached the church at the bottom of the village and, if you’ll excuse me, I’m going into the churchyard to pay my respects to my neighbours Sofia and Yannis who have both passed away in recent years. In the summer a new birth has graced the family. And so the cycle of life and death continues, as it must, for all of us like every other living thing but isn’t it wonderful to be a part of it? Thanks Steve. Keep em coming.